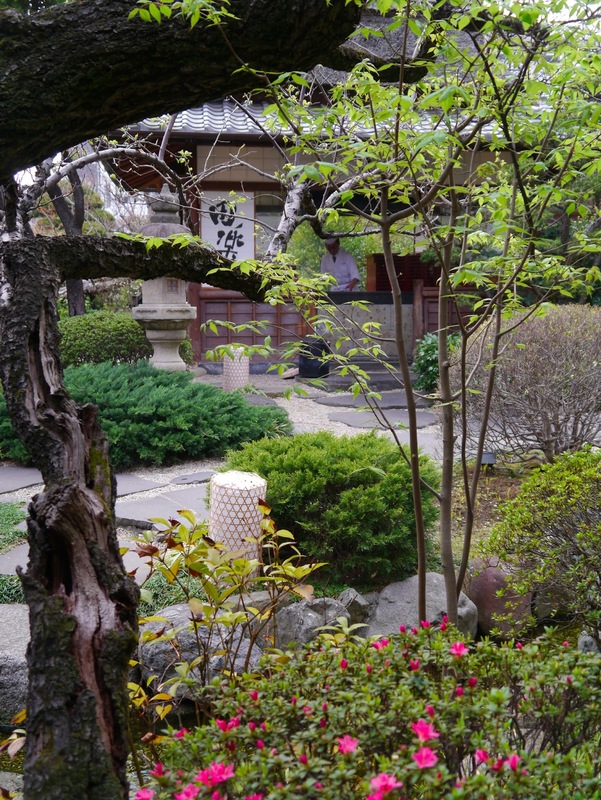 The greeting at Ukai reflects the aesthetic established in the garden. 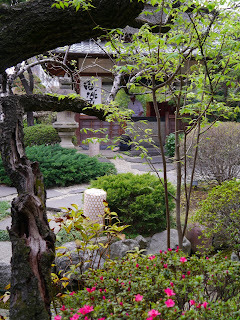 Around ten traditionally-dressed servers met us in the foyer and bowed deeply before one guided us through the labyrinthine corridors to our own private room which looked out over a beautiful corner of the garden. 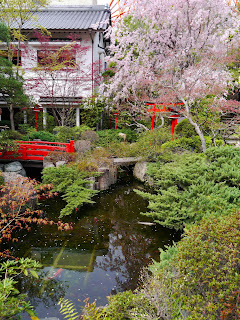 Some gentle traditional Japanese music played in the background, but we were transfixed by the view and the skill put into the composition of the garden. It really was a feast for the eyes. All of these elements should give you a clue that we're not in for culinary fireworks, but a meal deeply rooted in tradition. There were two options on the lunch menu and, since we weren't pressed for time, we chose the more extensive one priced at about Yen 6,500. It started with a cold dish of squid stuffed with a glutinous rice. The dish was scattered with some cherry blossoms, which were at the height of the season when we were in Tokyo. Simple clean flavours were given some sweetness from the flowers which were incorporated into the thickish slick of juice which coated the slices. 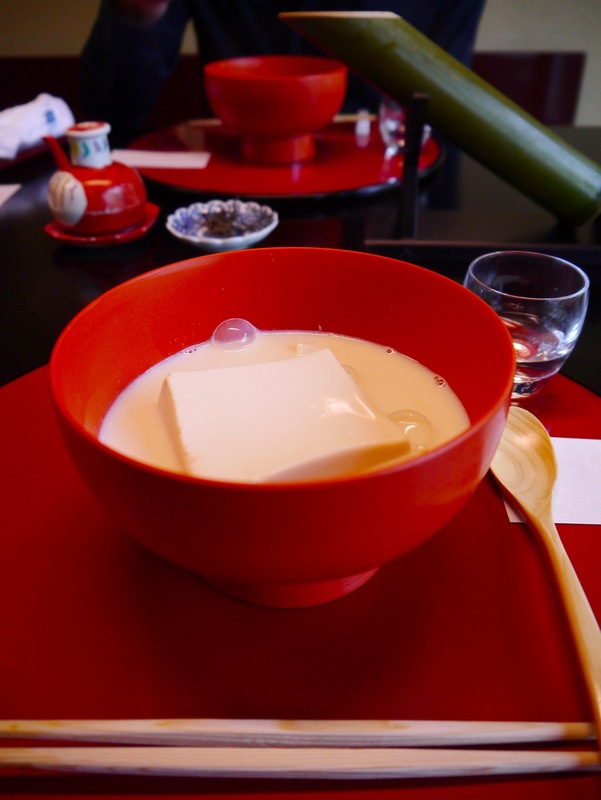 Next came one of the signature dishes of Ukai - a grilled square of tofu, coated with a sweet miso paste. This was a delicious, thin crispy bite which was served with a very eggy omelette. If you walk into the main garden after you eat, you will find one of the chefs preparing these treats over hot coals. Next came a sashimi course of tuna and Spanish mackerel. Although only a few small bites, I really enjoyed the mackerel which was super-fresh, as you'd expect given that Ukai is not that far from the Tsukiji markets. We moved onto a meat course, with a simple simmered pork dish served in a thin soy-based broth. The pork was incredibly tender with a texture almost like butter. A small boiled potato and greens completed this deceptively complex dish. The next dish had three components. A green pea soup, was a little starchy in texture, but pleasant enough. A slab of tofu was presented draped over some butterbur, which has the texture of celery but a wildly different flavour. A sauce made from a mixture of wheat gluten and tofu dressed the dish. The final mouthful was some simple bamboo-grilled octopus served with a sansho pepper leaf which had a slight numbing effect to this lovely mouthful. We were then presented with a massive steaming cauldron containing two blocks of freshly made tofu bobbing in a steaming vat of soy milk. They were scooped out with a pool of the hot milk and we were instructed to eat the tofu block before then adding the additional condiments, which included soy sauce and dried seaweed, to the remaining broth. The tofu was earthy, milky and creamy and unlike any I'd enjoyed before. There were a few more courses to go. A charcoal-grilled piece of masu salmon had a wonderful smoky flavour. Surprisingly, the flesh was white rather than the pinky hue I associate with salmon. The fish had been filleted, with the backbone deep fried and added to the plate for extra texture and crunch. Some seasonal vegetables finished this pleasant dish. We entered the home stretch with a rice course. A pretty bamboo container was filled with a layer of warm rice and topped with salmon roe and some fern quills. A crunchy slice of bamboo and some shavings of an omelette, which looked a bit like vermicelli, completed it. Some pickled cabbage was served on the side with a miso soup. Naturally, the meal finished with a tofu-based dessert. Delicate folds of a sweet soy milk pudding were dressed with some red beans and given a flash of flavour from a green herb which had a minty, aniseed hit to it. Throughout, we were served by a young, friendly, traditionally-dressed girl, but she didn't speak an awful lot of English (and my Japanese is essentially limited to konichiwa!). The only problem was that the courses came in such quick succession that we hardly had time to appreciate it. We tried to ask for more of a break between each dish, but we couldn't really make ourselves understood. Maybe it was the beautifully-distracting view that slowed our eating, or perhaps it was because we went for lunch and the expectation from the restaurant is that it is meant to be all over in a lunch hour. Either way, I felt a bit rushed, and we didn't have the opportunity to savour the food. Despite this, I thought the meal was good value with interesting preparations of an ingredient you might not usually put at the centre of a menu. 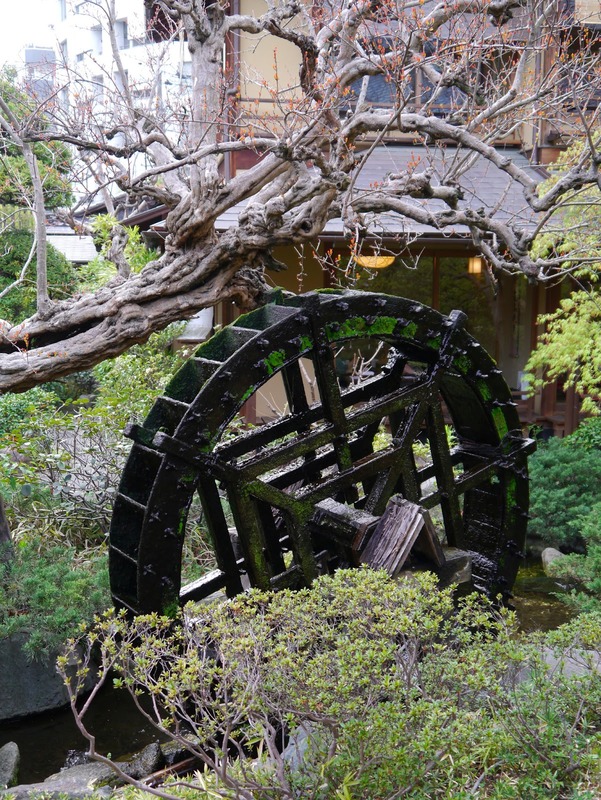 So put Tofuya Ukai in your "maybe" pile for that Tokyo restaurant list you're considering. 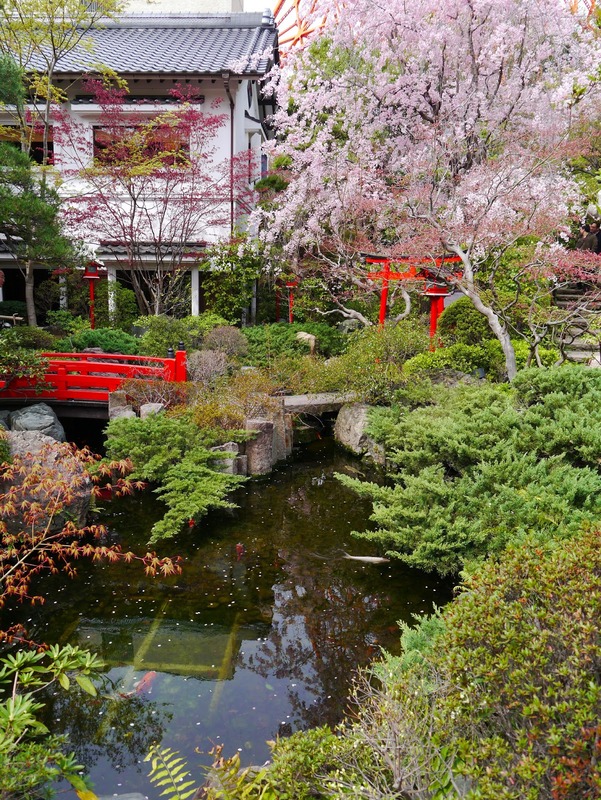 Or maybe put it in your "must eat" column if you're a fan of beautiful Japanese gardens. Wow - it looks stunning, I love tofu so much. Shame about the timing issues. I think we were just unlucky Lizzie. Julie (City Caphe) ate there at around the same time but for dinner and had no problems. Ask her how good the steaming cauldron of tofu was!